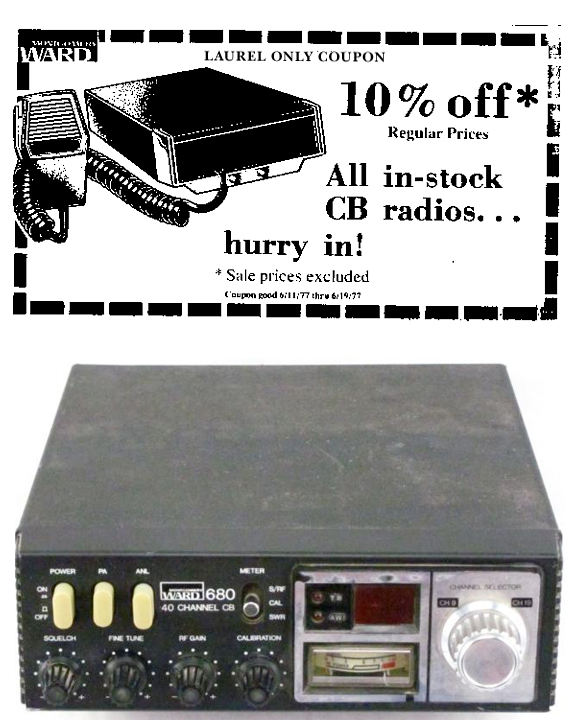 Breaker one-nine, breaker one-nine… We’re cruisin’ the mall with our Montgomery Ward CB radios, good buddy. Laurel had quite the CB radio following in the 1970s—a veritable convoy, if you will. Those in the know created an informal “CB Club” that would meet at designated spots—including the original IHOP parking lot, among others, before proceeding to hang out. The topic was getting quite a bit of radio chatter over on the Lost Laurel Facebook page today. Our hang-outs were the bowling alley and the upper level parking at the mall (until security would come) Then we had “Roll Call”, about 100 of us, once a week. Back in the day, the Laurel Montgomery Ward electronics department actually maintained an operating CB radio base station. They used the handle “Monkey Base”. 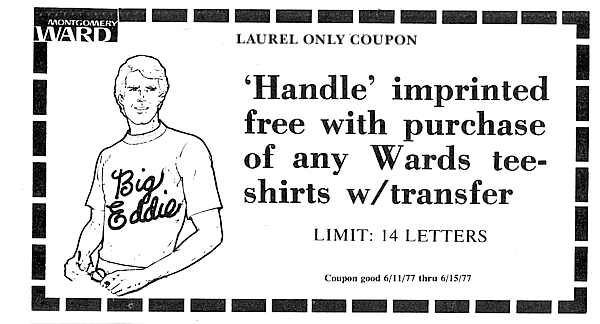 Wards seemingly went all out for the fad, even offering to print your CB radio handle (up to 14 letters) for free on any T-shirt you bought—as evidenced by the coupon below (complete with stylish line art of a 1970s guy rocking a shirt that reads “Big Eddie”). Naturally, this begs the question of whether any of our Laurel CB Clubbers had a shirt printed. Breaker 1-9, Wrongway, come back? Breaker 1-9, Little Dancer, are your ears on? Hello? Anyone? 10-4. Great blog! 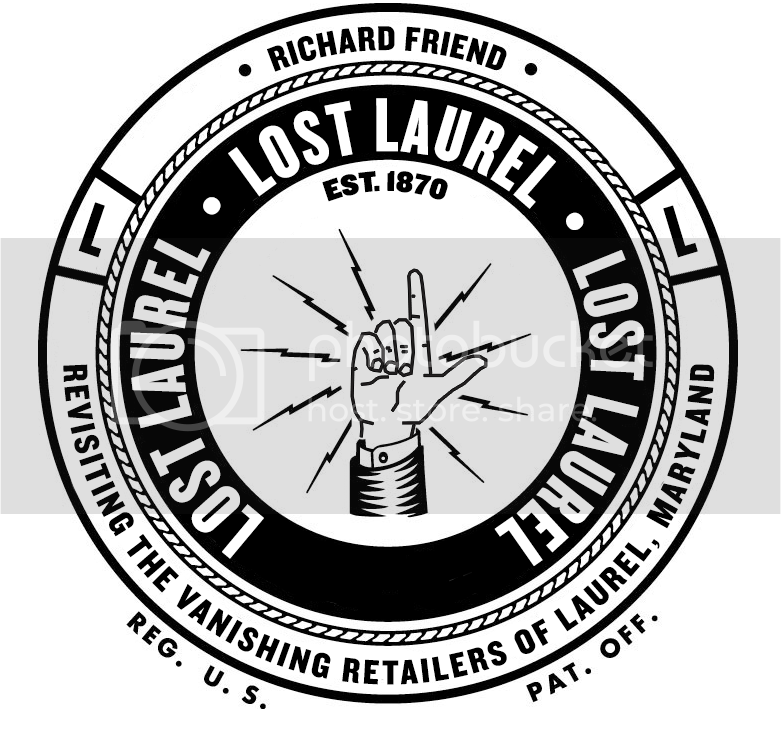 Glad to see someone is documenting the history of Laurel — esp. the mall. Keep up the good work. I used to always go to the mall and don’t quite understand what happened, but I’m sure I’ll get a better sense of it the deeper I explore what you’ve documented.